A winning double at Bendigo on Thursday made it 15 winners from the last 30 days for Ballymore Stables and both fillies - Spanks and Sound Works - look to have plenty of potential. Having just her second start, the two-year-old Spanks (pictured) showed good speed to share the early lead, taking over with 300m to go and showing plenty of fight in demanding conditions. "It was like a New Zealand heavy track!" 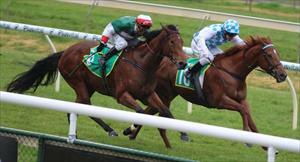 Michael Moroney said, pleased with the progress Spanks has made since her Pakenham debut second in early June. Settling mid-field and getting to the outside of the track, Sound Works was impressive making her Victorian debut later in the day. Whilst successful at Canterbury (in Sydney to make the most of the BOBS bonus scheme), Sound Works was not really happy at that track with the bigger space that is Bendigo suiting her more. Always considered a filly of stakes class potential by the stable, Sound Works is an imposing lass with plenty of upside. We head to Caulfield confident that our winning run can continue with two nice chances in the shape of Lord Barrington and Strike Force. While he has drawn a horror gate out very wide, there are already several scratchings in the Cove Hotel Handicap to be contested by Lord Barrington. "And there is just the one turn at the Caulfield 1200m, " Moroney said, adding that "if he gets any luck in running he should prove hard to beat." Performing consistently in similar grade of late, the son of Darci Brahma will be ridden by in-form apprentice Jake Bayliss whose 2kg claim brings the horse in well. Later in the day Strike Force takes his place in the Racing Photos Handicap and Moroney is interested to see how son of Lookin At Lucky performs having his first crack at 2000m. "I think he is the sort of horse who can sit on pace and just keep going," Moroney said, joking that not everyone in the stable agreed that the young horse will get the trip. "But his sire won the Preakness over 1900m and he is out of a Giant's Causeway mare." Meanwhile in Queensland we have Tivaci looking for a change of luck in the Gr.3 Sunshine Coast Guineas. "He keeps drawing inside gates and end up having to make rails runs which does not really suit him," Moroney rued, noting that he has again drawn inside in two. "So long as he can get out into the clear where he likes it he is the one to beat," he said, adding that "I have no doubt that he is the best horse in the race." Sunday sees us take a couple of decent chances to the Sale meeting, kicking off with The Bunsta in the BM64 sprint. Having his first run since the spring, the Pentire five-year-old has pleased us with two "terrific" recent jump-out efforts and is primed to run well first up. "He has got a good record fresh and a forward showing will not surprise." Barnsley, who contests the following race, has drawn out wide but has trained on nicely since a smart victory at the same track last month. "He really toughed it out from a wide gate in the going last time and Ethan Brown's 3kg claim makes him look good at the weights."